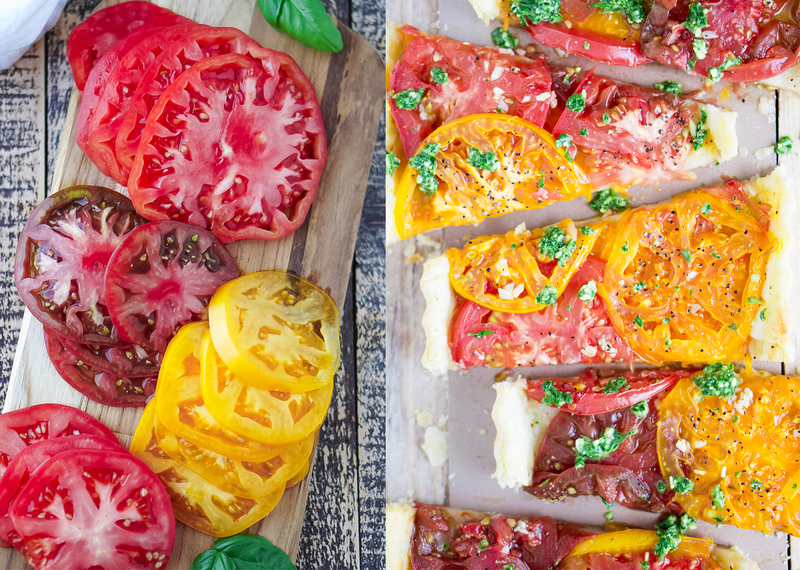 Colorful Tomato Tart | Eat. Love. Namaste. A few weeks ago, Jay and I went with some close friends to visit one of our favorite wineries in Cleveland, Hundley Cellars. We stayed at the winery for a few hours to enjoy a few bottles and to relax and enjoy each other’s company. At Hundley’s, they also serve delicious appetizers and light snacks, but I ended up making this tomato tart to bring along; and boy was it the perfect match! Good wine and a fresh tomato tart for the win! If you are a wine-o like me [yes, I am having a glass as I write this post] and you live near Cleveland and love to support local businesses, then this winery is a must! It’s a family owned winery, the atmosphere is pretty chill, and their wine is our absolute favorite! Previously, I only drank dry reds, but when I tried their Pinot Grigio, I was instantly hooked. I tried more of their whites, and I can’t say enough great things! They even make a delicious Rosé called the Pink Camo, and oh-my-word is it yummy!! Yes, this girl loves her wine over here! Now back to this recipe! 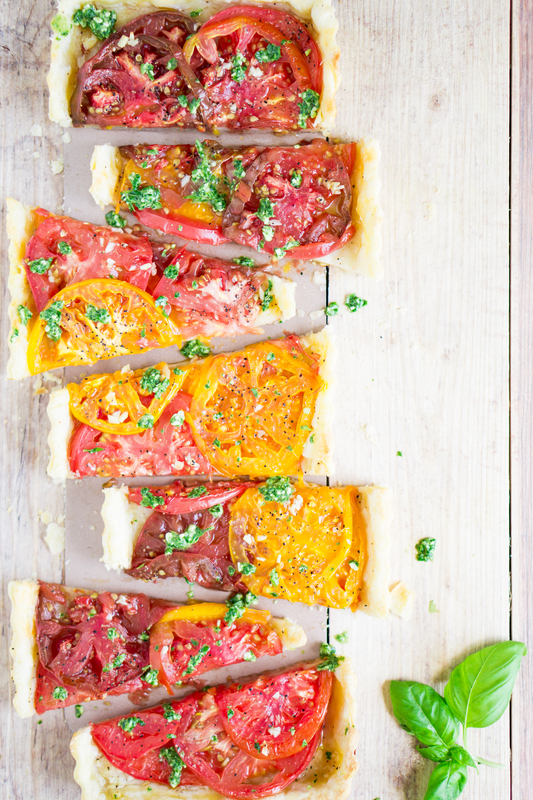 This tomato tart is super simple and is ready in less than an hour! Add fresh garlic and basil on top to make the flavors pop! 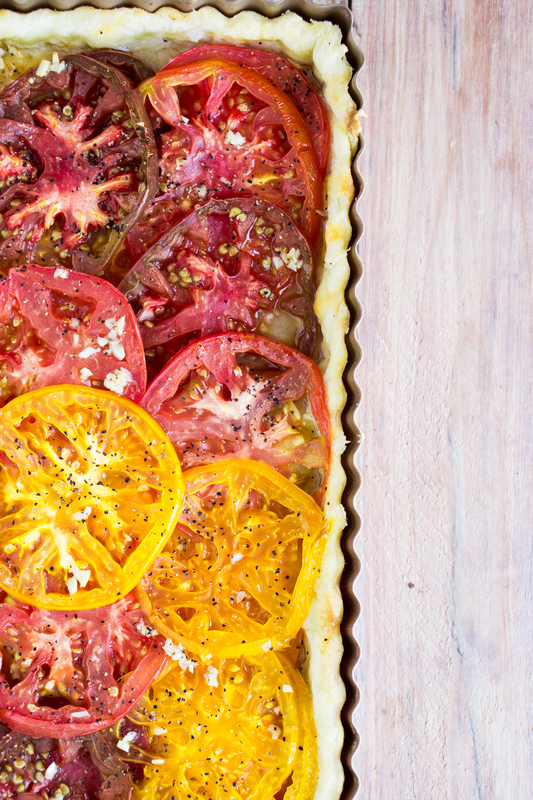 I hope you all love this tomato tart, especially since it’s so dang colorful! 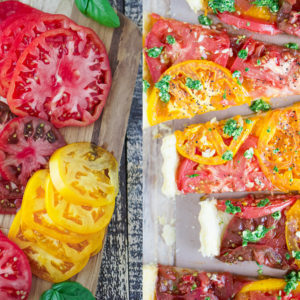 This colorful tomato tart is tasty and pairs wonderfully with wine! Can be made in less than an hour! Pulse flour, salt, and sugar in a food processor. Add butter, and pulse until mixture resembles coarse meal. While pulsing, drizzle in the cold water until the mixture begins to hold together. If the dough seems dry, add more water; 1 tablespoon at a time, pulsing after each addition. On a lightly floured surface, roll out the dough to a 16-by-6-inch rectangle to fit into a 14-by-4-inch rectangle tart pan with a removable bottom (non-removable pans, place dough on parchment paper). Pierce bottom of dough all over with a fork and refrigerate for 10-minutes. Bake crust for about 25-minutes or until golden brown. Remove from the oven to cool completely (keep the oven on) and cut the tomatoes into 1/4-inch thick. Brush the olive oil and minced garlic over the crust and add the tomato slices on top. Season with a pinch of salt and pepper and bake uncovered for 20 to 25-minutes. Remove from oven, top with minced garlic, fresh chopped basil, and a drizzle of olive oil. Cool slightly before unmolding and serving!